A turnover is a kind of pastry made by placing a filling on a piece of dough, folding the dough over, and sealing it. Turnovers can be sweet or savory and are often made as a sort of portable meal or dessert, similar to a sandwich. Left: Sweet turnover made from puff pastry. 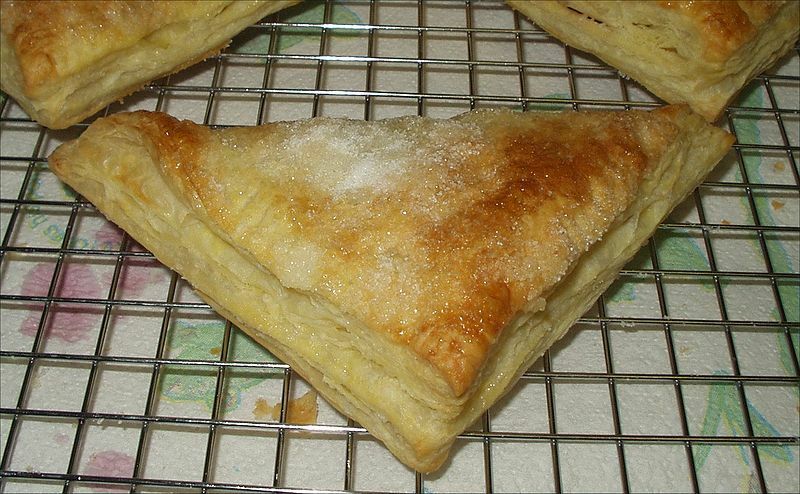 It is common for sweet turnovers to have a fruit filling and be made with a short (pie crust-like) or puff pastry dough; savory turnovers generally contain meat and/or vegetables and can be made with any sort of dough, though a kneaded yeast dough seems to be the most common in Western cuisines. They are usually baked, but may be fried. To make these delicious triangles, take out your puff pastry and allow it to thaw a little. It doesn't need to reach room temperature, but you should be able to work with it. In a frying pan sauté the chopped apples in butter. Allow to cook for 30 seconds and then add in the sugar. The amount depends on how sweet a sweet-tooth you have, but several tablespoons are usually necessary. Next add in the cinnamon and allow to cook for several minutes. The apples should lose some of their water but still be a bit crispy. If you turn it into mush, it will still be tasty but the texture is lost. Roll out the puff pastry dough, into approximately 20 squares. Place a heaping spoonful of the apple mixture in the center and fold the square over into a triangle to seal it. Then, brush the top with egg wash (egg mixed with a bit of water or milk). Place the turnovers on a baking sheet with parchment paper in a 350ºF oven for about 30 minutes, or until they are a golden brown color.